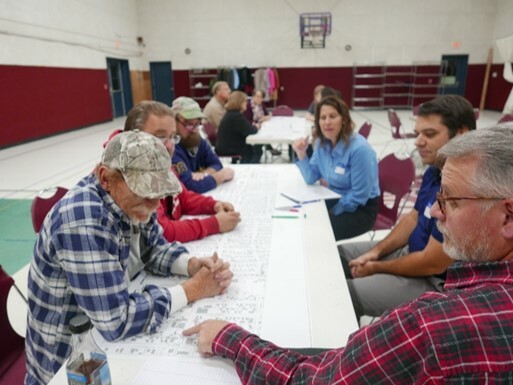 In late November, University of Illinois Extension collaborated with Hanson Engineering, City of Pekin, and UIUC Department of Urban and Regional Planning in conducting a planning study. The study looked at the area's needs, assets and opportunities with the focus on better serving residents, visitors and businesses who use the street regularly. The planning process examined issues such as walkability, street beautification, parking needs, traffic calming and safety. The idea is to improve the quality of life on Derby. Teresa Anderson, a UIUC Masters' student, is part of the Hanson team as a mentee. Ms. Anderson is looking to use Derby Street as her Capstone Project. After the completion of the Derby Street Corridor Plan and Revitalization Project, Ms. Anderson will have experience in several of the identified necessary expertise areas. Both Hanson and Common Ground are looking forward to the opportunity of giving back to the industry through mentoring Ms. Anderson and incorporating her fresh perspective into the Derby Street Plan. Derby Street is a thriving commercial corridor and the gateway to southern Pekin. The project represents the first comprehensive planning study ever taken to address the unique challenges that make this street vital to the Pekin community. A community steering committee made up of residents and businesses and interested parties who are directly affected by activities on Derby Street. Were engaged in the planning activity. The planning project is an excellent example of community collaboration and campus engagement. Hanson Engineering and the City of Pekin have provided exceptional support in creating this programming partnership, establishing a solid foundation for community and student learning. The engagement work demonstrates how the university can be responsive to a critical community need. This programming cuts across the university's mission of teaching, research and service. Derby Street Corridor Plan & Revitalization Study Final Report.